Fragrance free moisturizing hand lotion. Periodic use skin barrier cream. 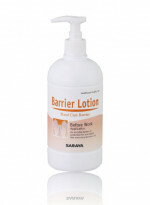 Moisturizing hand lotion for health care professionals.